So why would anyone spend almost $40 to take three people to see a movie that is twenty years old and that all three had seen dozens (if not a hundred times)? That's easy, it's "Jurassic Park ", back on the big screen. I'd have paid that to see it on a regular screen without the 3D. 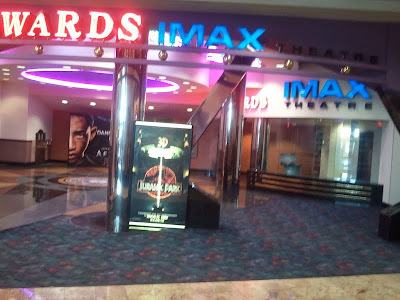 The fact that we saw it in the third dimension and on a giant IMAX screen is just a bonus, although one of my companions did say that all viewing of "Jurassic Park" should be on IMAX, so everyone has to get a 70 foot screen for their home. That's not really practical but I know exactly what she means, this movie rocks on the giant screen. There were details that you could maybe see on a big TV, if you paused and looked closely. Here they are right in your face. A few weeks back I posted on another bloggers post on this film, a brief story about seeing this twenty years ago, here I want to share the longer version of the story. We saw this movie with my friends Tim and Jamie Martin. My kids were little and we had my Mom baby sit for the night. We went opening night so it was packed because this was one of the biggest movies to open not just that year but ever. We only saw Tim and Jamie a couple of times a year, we went out to dinner, and then to the movie, it was a big deal. Sitting in front of us in a packed theater, were three or four twelve to fourteen year old boys. As kids at that age do, they started acting up a little, mostly just showing off for each other. I was very patient waiting through all the trailers for them to calm down (one of the trailers was for "The Flintstones" which was just a teaser and was not coming out for a year). Anyway, there was not another spot to move to, so I waited. When the screen goes dark and the "Universal" logo scrolls on the screen, John Williams ominous music cue starts and it sounds like a dinosaur, stomping through the dark. One of the kids sitting in front of us says out loud so the whole audience can hear his jaded attempt at humorous bravado "Oow, scary!" It is at this point that I leaned forward and said to all of them, "You haven't seen scary until you've pissed me off. I don't want to hear from any of you for the next two hours!" In 1993, I wore my hair long and my beard big, and in the dark I probably looked like Charlie Manson staring at them. They shut up and when the movie ended skedaddled out of the theater shooting me nervous looks. i know that a lot of people these days avoid going to films in theaters because of boorish behavior, but unfortunately that behavior is not new, it is just intensified with the advent of the cell phone. Today, twenty years later, the movie is still terrifying and exciting and fun. The attack of the T-Rex is one of the best fright scenes in movies, and it goes on for nearly ten minutes. There is plenty to be impressed by, but when it is on the really big screen, and in 3D, it is extra impressive. 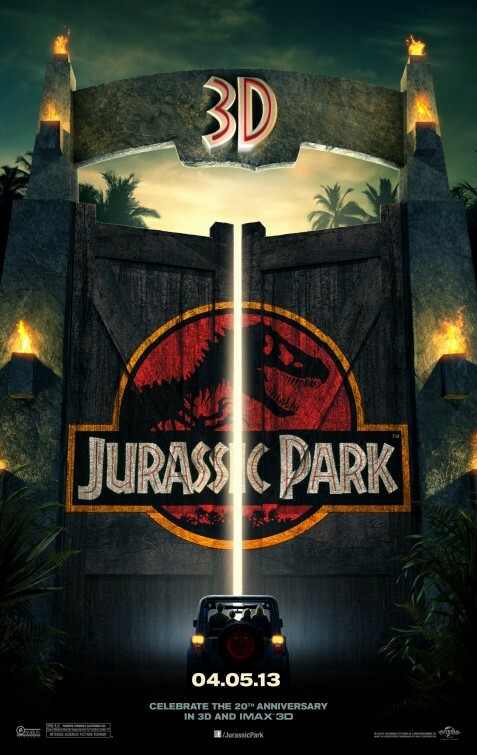 Jurassic Park does not need to be in 3D to be effective, it's just a little something extra to sweeten the experience and make us want to go through it all again. Spielberg's trademark extended tension scenes are still there, his empathy for kids going through a divorce, and his ability to empathize with characters who are way over matched is what makes his movies more than just action films. Spielberg creates drama to go with the action. When I read the book back in 1991, everyone was casting in their heads for the main leads. I had always envisioned Harrison Ford as Dr. Grant and William Hurt as Ian Malcom. Sam Neil and Jeff Goldblum are now so much a part of the way I see this movie that I don't know what I was thinking. Goldblum of course has all the great lines and his delivery could not be matched by anyone. The extra reach of the T-Rex as it is chasing the jeep makes his line "Must go faster" even more appropriately understated. 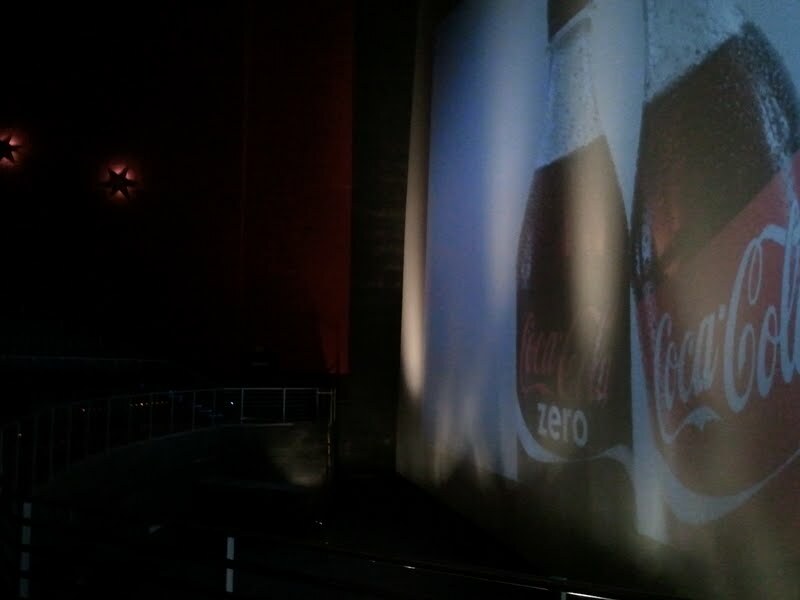 I don't know if you will be able to see, but the theater we went to featured a real IMAX screen, not one of those Fauxmax screens that AMC tries to pawn off on the public. The screen drops about ten feet below the first row and towers over all the remaining rows except for the very back where the screen is only ten feet higher than the highest row. We sat three rows from the front, right in the center and it is easy to justify the extra travel time and expense to see the movie in this format. Lovers of movies probably know the story of how Spielberg changed the way the movie was going to be shot after seeing a test real of digitally generated dinosaurs. The huge animatronic puppets that had been created for the movie by the Stan Winston Studios, did not go to waste. They are integrated into the movie very effectively and they look terrific. The eye work on some of those puppets is creepy and especially good at selling the illusion that these creatures are real. Phil Tippets stop motion animation doesn't end up in the film as far as I can tell, but you can visualize several scenes where it was probably going to be the tool they used until the digital dinos came along. Here is an L.A. Times ad that was run before the movies nearly twenty years ago that illustrates the relationship between these two techniques. 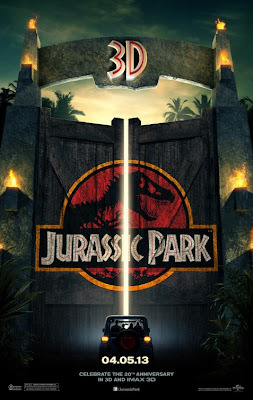 There have been two sequels to Jurassic Park and from my point of view they are both highly entertaining. I fervently hope that the Fourth film, scheduled for next year in the summer, is also fun. I doubt that it will match anything in it's twenty year old ancestor, despite the improving technology. Spielberg is a producer on it, so there will be some standards applied, but the creativity that went into the original Jurassic Park is never going to me matched, it can only be imitated. Hey Kirkham, keep up the great work! You seriously provide some great insight on each film you review and the stories of old movie going experiences are awesome! Kubrick is one of the top five or six best directors of all time. 2001 is one of the greatest pieces of art of the 20th Century. I've seen all of his major films, there are a couple of early ones I need to find at some point. When summer gets here I'll try to do a post on his work. Thanks for continuing to stop by. Look forward to that post, and sure ill keep doing so. A Few Things I Miss At the Modern Movie Theater.